Webhooks are a way of transferring information into and out of web apps through simple HTTP posts, usually containing data in some kind of structured format (JSON or form key/values). If that makes no sense whatsoever, then don't worry too much, it's not that difficult once you get going. However, you might find it easier to learn the concept of webhooks by receiving webhooks first, rather than sending them (as sending involves a few more steps). In Flow XO, you'll receive a webhook via a trigger. To set up a webhook, start a new flow, and click the + button to create a new trigger. Most of the time, you'll want to move data between a cloud app that supports webhooks into a Flow XO flow. So now's the time to figure out how to set up your webhook in your application, and copy and paste this URL into the other app. To make sure it works! So that we know what to expect, so we can let you drag/drop the info you'll get from your webhook into the rest of your flow. That's actually all there is to it! After you've named the trigger (something more memorable than just 'Webhook'), you'll have a flow that is triggered every time you take the action in your app. To see what information the flow received from the trigger, you'll need to create another task and take a look at the outputs that are available to you. When receiving webhooks, Flow XO takes care of recognising the format and converting the structured data into outputs that can be used later in other tasks. URL query string - you can make HTTP GET requests and use a query string in your URL. Note that values in the query string are only recognised in GET requests. No data - you don't have to send anything. You might want a webhook to start a flow without passing any information in. 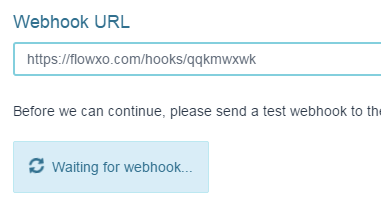 If you hit a Flow XO webhook URL in your browser, you're making a perfectly valid HTTP GET request that will work as a trigger. In some situations you might find it useful to trigger a flow manually by hitting the URL in your browser, or even creating a shortcut to it on your desktop for quick access. So every time you hit the webhook, your flow will have the output this_key set to whatever value you give in the URL. You can send data as JSON (content type application/json) or form data (content type application/x-www-form-urlencoded). The content-type header is automatically added for you. There's also an option to send a raw body, which along with a suitable manually added content-type header, allows you to send any other type of data, including XML or plain text. Headers can be added to the request. There's support for basic authentication, which converts the credentials you give into an Authorization header. Note that if you also explicitly provide an authorization header, this will override it. You can use nested JSON in your requests, and also choose to send your JSON wrapped in an array. See the JSON Options section below to see how. You can either have the request send all the data collected so far (by not adding any specific key/values), or tell the request what data to send by adding at least one key/value. To send nested JSON, you should make sure that Enable JSON nesting is ticked, and use double underscores (__) to notate your nesting. It's also possible to sub-nest your data (address__line1__house_number). The request will output the status and body that it receives back in the response. The status is the HTTP status code (usually 200 for a successful request) and the body is the content that the server returns. If the request results in a status code of 500 or higher (or the request can't complete), it will be marked as failed in the logs and the flow stopped. If your request returns structured data (either JSON or XML), it will be contained in the data output. This is a special data output type, and you should refer to the documentation for help using it. RequestBin (Pipedream) - a good place to send your requests to whilst testing (to check the format). Postman - a Chrome app that helps you to send test webhooks.